When it comes to space, dozens of countries now have satellites circling the globe, which requires an eye on the skies, so-called space situational awareness (SSA), due to the dangers posed by falling space debris. In US the space surveillance mission falls to Joint Space Operations Center (JSpOC), located at Vandenberg AFB in California, which is tasked to detects, track and identify all man-made objects in Earth’s orbit. The JSpOC maintains the catalog of all man-made Earth-orbiting objects, charts preset positions for orbital flight safety, and predicts objects reentering the Earth’s atmosphere. Since the launch of Sputnik in 1957, over 39,000 man-made objects have been catalogued, many of which have since re-entered the atmosphere. Currently, the JSpOC tracks more than 16,000 objects orbiting Earth. About 5 percent of those being tracked are functioning satellites, 8 percent are rocket bodies, and about 87 percent are debris and/or inactive satellites. JSpOC tasks the Space Surveillance Network (SSN), a worldwide network of 30 space surveillance sensors (radar and optical telescopes, both military and civilian) to observe the objects. The JspOC team match sensor observations to the orbiting objects, catalog, and update the position and velocity of each one. These updates form the Satellite Catalog, a comprehensive listing of the numbers, types, and orbits of all trackable objects in space. The JSpOC uses the SSN to take between 380,000 to 420,000 observations each day. The SSN sensors are categorized as dedicated (those with the primary mission of performing space surveillance), contributing, or collateral sensors (those with a primary mission other than space surveillance). SSN Sensors use a “predictive” technique to monitor space objects, i.e. , it spot checks them rather than tracking them continually. Accomplishing its mission the JSpOC requires referring to multiple data sources from separate systems, which introduces the possibility for errors. 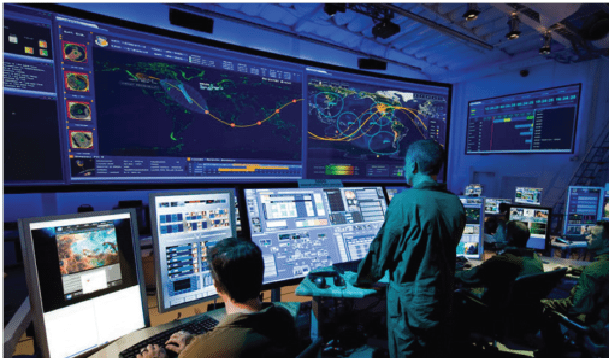 The US Air Force Space Command recognized the need for an innovative technology to support space situational awareness beyond the existing legacy toolsets and conveyed that need to the Air Force Research Laboratory. The answer is the new JMS (JSpOC Mission System) program, which is predominately a software effort, produces an integrated, net-centric Service Oriented Architecture (SOA) and the necessary software applications. The JMS program provides a collaborative environment that enhances and modernizes space situational awareness (SSA) capabilities; creates decision-relevant views of the space environment; rapidly detects, tracks and characterizes objects of interest; identifies/exploits traditional and non-traditional sources. Space Object Identification – Identify, analyze, and maintain a thorough database of objects in space at a given time as necessary to provide a robust and accurate space-operating picture. Spectrum Characterization – Identify, analyze, and resolve interference problems in the electromagnetic spectrum and operationally characterize non-kinetic activities and effects within the realm of space operations. Launch/Reentry Support – Provide awareness and warning of potential threats to US space systems, including thorough knowledge and rapid identification of all objects being launched into, traveling through, or de-orbiting from space. Joint Forces Support – Provide space products, services, and effects to military, commercial, and civil entities worldwide. Support to Contingency Operations – Protect space capabilities and provide on-order, tailored delivery of space effects.